Most people have questions regarding the motorcycle and scooter lessons and the training process. We answer the most common of them here. Information about the licensing process is available here. If you still have any queries please don’t hesitate to contact us. Details of our charges are available here. How long it will take depends on previous experience, your physical and mental confidence and the length and frequency of lessons. We have taken people for their practical tests after only two or three lessons. Others need more. You can contact us to discuss this further. Alert’s training process is flexible. Students progress through the various stages at their own pace as their confidence builds. Basic riding skills and bike familiarization are learned in a quiet off road environment. You won’t be on the road until you are ready! We still begin in a controlled environment. Less time is needed to master the basic machine skills prior to venturing into traffic. Your instructor will work with you to determine your particular needs and set up the appropriate exercises. WHAT BIKES WILL I BE LEARNING ON? Our bikes are all late model, regularly serviced and mechanically sound. See our motorcyles & scooters page for more information. All you need is a learners permit. 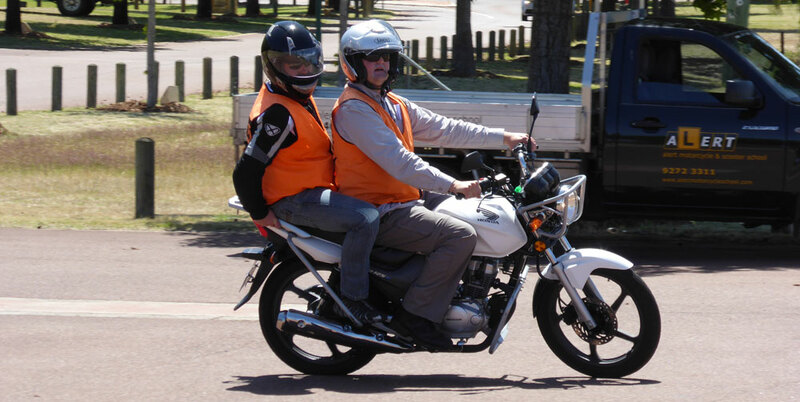 This allows you to ride on the road whilst being supervised by a licensed instructor. You can obtain a permit from any Licensing Centre. We provide full face helmets, gloves and wet weather gear. Gloves are optional but highly recommended. You need long trousers and covered shoes or boots. Singlets, shorts, thongs or sandals are all unsuitable for motorcycle and scooter riding. WHEN DO I RIDE IN TRAFFIC? Simple – when you are ready! There is a basic set of machine skills you need to have before you can safely venture onto the road. No matter your previous riding experience we always go through our roadcraft theory prior to negotiating the traffic environment. WHAT IS IN THE TEST? The examiners look at your riding skills and roadcraft. 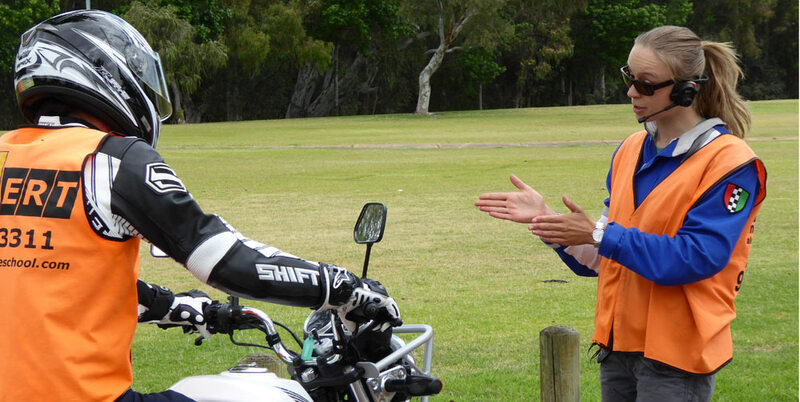 You need to demonstrate an emergency stop, slow control (figure O) and a hill park. They follow you as you ride through normal road and traffic conditions to observe and assess your roadcraft. You have to demonstrate that you are observant and safe and that you understand road positioning and that you obey the law. WHERE CAN I GO FOR THE PRACTICAL TEST? Alert services all the metropolitan licensing centres. See the licensing info page for location details. WHAT DO I NEED FOR THE ‘R’ CLASS TEST? For the open ‘R’ class permit you need to have an RE license. You must hold the ‘RE’ licence for twelve months before you are able to do ‘R’ class practical test. WHAT HAPPENS IF IT IS RAINING FOR MY LESSON OR TEST? Lessons and tests will go ahead as scheduled. Our training makes riding in the wet as safe as riding in dry conditions. We have a range of wet weather gear for students to use. Required stopping distances in the emergency stop test are increased according to the conditions. CAN I DO LESSONS WITH A FRIEND OR PARTNER? Yes. Two people can learn together with a single instructor. This generally increases the number of lessons needed. Discount rates apply for two-to-one lessons. Contact us to discuss details. CAN I DO LESSONS FROM HOME? Yes. Travelling time may have to be taken into account when determining the fee. You can contact us directly to discuss your particular situation. 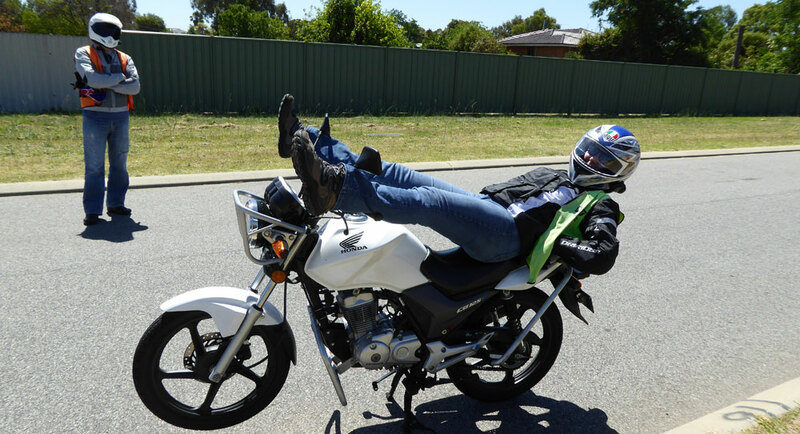 I OWN A MOTORBIKE – CAN I USE IT FOR LESSONS AND THE TEST? Yes. Call us to discuss this if it’s your preference. You book tests by phoning the Department of Transport on 13 11 62 or online. Licensing Centre locations are on the licensing info page. Chris and I would like to thank you for training our youngest son to ride a motorcycle. We wanted the best and as far as we are concerned that is what we got.